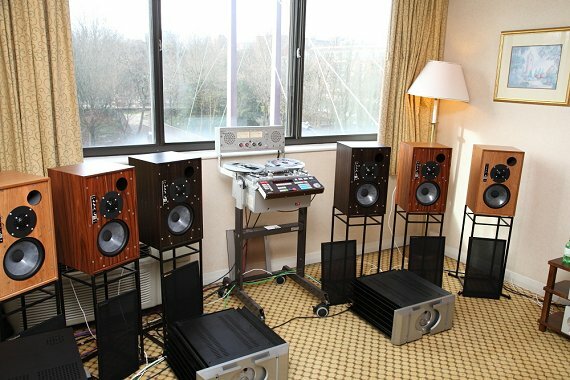 Graham Audio launched the brand new BBC licensed LS5/9 at Bristol's premier hi-fi show. Over the course of 3 very busy days, we welcomed over 2,000 visitors to our demonstration room, and were overwhelmed with positive feedback. Many people told us that we had the best sound of the show! We used a mint example of the exotic NAGRA T ¼" tape recorder as our primary audio source, and complemented that with an EMT 948 turntable. Naturally, both CD and SACD playback were also catered for, along with high resolution digital media playback courtesy of the superb CAD 1543 from Computer Audio Design. Amplification was from PASS LABS and Luxman, both of which worked superbly with the LS5/9. Derek Hughes was present throughout, and was happily chatting to visitors over the duration of the show, offering insights about the design process and the BBC's legacy to the UK hi-fi industry. Our dedicated LS5/9 open frame stands attracted lots of praise for their performance and aesthetic appeal. These support the loudspeakers at each of their corners on carbon fibre rods, allowing the bottom panel to flex in the same manner as others, which is integral to the BBC "thin wall" design principle. We look forward to our next show, which will be Munich High End in May.